One universal truth about kids is that kids gotta move! I wouldn’t want to put any limits on my kids’ exploration, which is why these water shoes are so awesome! They cover so many outdoor and indoor activities for toddlers–wet or dry, slippery or rough terrain! Toddlers already are a little unsure on their feet. They are just starting to explore their world on foot. Protecting those cute little soles (no pun intended) is going to be a major priority! This includes places you’ll take them like water parks, amusement parks, camping, (icky floor) gyms, as well as pools, lakes, rivers, and oceans. Some of these shoes are great for walking and hiking and even sports. It all depends! Some major concerns are slips, rough terrain and gravel, and being able to go from wet to dry without getting waterlogged or chafed. There are a lot of options out there for keeping feet and little people safe! And that means, there are a LOT of things to think about! Design. Water shoes vary quite a bit in coverage and weight, from thin straps to a full sneaker. They can be made of leather, synthetic materials, or textiles. Ease of putting them on. One concern, especially for toddlers, is ease of putting them on. Watch for if they are slip-on and what kind of straps or ties they use. Comfort. 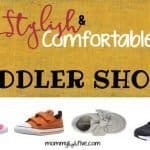 As a parent, the last thing you want in a toddler shoe is one that hurts, rubs, or causes any other discomfort. With a water shoe (depending on what activity you are doing), you want a shoe that will protect your child’s feet and not cause blisters. Durability and wear. 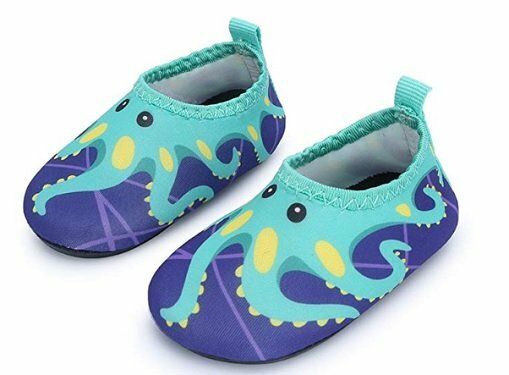 You want toddler water shoes that are going to breathe and dry well. Another factor is how stinky they will get and how easy to wash they are. Some shouldn’t go in the washing machine, and some are more breathable and anti-microbial than others. Sizing. This is important! Too loose can cause tripping or slipping. And too tight, especially with perforations, can cause blisters. Too big can mean your toddler trips and falls more easily. It can also be tricky to find the right toddler size in stock. Color/pattern. Your child’s preferences will make a big difference here. Some shoes offer more colors and patterns than others. Even the design creates a big difference in style. Most are pretty basic, but a few have a sporty design or a fun pattern. Ethics and Safety. Synthetic materials can potentially create a lot of harmful emissions in the environment when they’re made. Leather is a concern for those avoiding animal products. Even textiles vary in how they are made–where they were made or imported from can make a difference in conditions. They can also be made with harmful dyes and chemicals. These toddler shoes by Native are very popular, and with good reason. They come in dozens of beautiful pastel colors with two-toned options too! These shoes are so high quality (they’re even approved by PETA and vegan)! They are made in the USA or imported with 100% Ethylene Vinyl Acetate (ETA), and the molding process creates zero-waste and low-energy emissions. ETA will form to the child’s foot, which means an excellent fit. These shoes are shock absorbent, odor resistant, and hand washable. 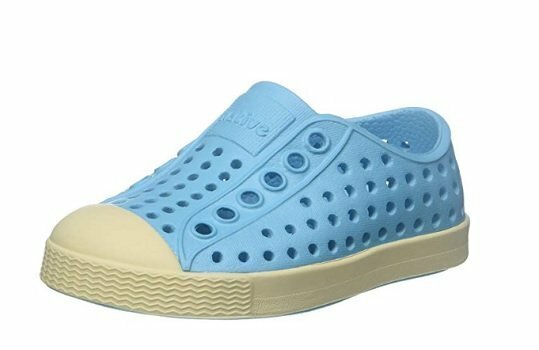 They have an awesome lightweight design: slip-on, with perforations allover to breathe, plus a rubber sole and toe with traction. One thing to look out for is that they tend to run a bit large. 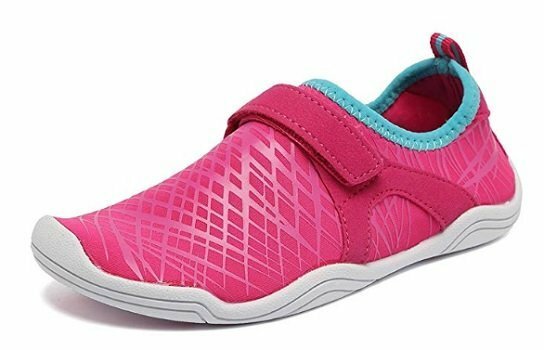 Stride Rite has been making water shoes for kids for 85 years, and they offer this sturdy sneaker design. There are plain options, but they also come in bright colors and fun designs, like rainbow and emoji. They use a hook and loop closure. The shoes’ uppers are made of Ethylene Vinyl Acetate, with a synthetic sole that includes rubber pods for non-slip. The shoes are made in the USA and are vegan. This is a very popular shoe, and a big plus is they can be washed in the washing machine. They do have an anti-microbial lining to help with stink, so hopefully that will cut down on the need to wash them often! 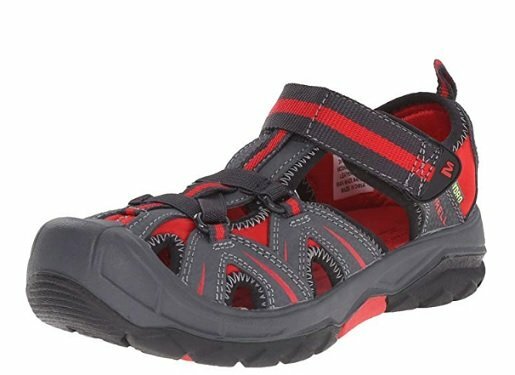 These shoes are a great choice for boating or hiking. CIOR offers an affordable textile water shoe in pretty blues, pinks, and blacks. The synthetic fabric is flexible, breathable, and quick-drying. The shoes have water grip outsoles to help with slips and a thick arch support to protect from stepping on rocky, rough surfaces. This is a comfy, lightweight shoes keeps feet dry and protects them during outdoor activities. CIOR has fun designs in this long-lasting shoe. They slip on and are stretchy, with a pull tab at the heel. These shoes are designed for a secure fit. Taking a trip to the beach? Take these shoes along. These shoes are adorable, affordable, and popular. JIASUQI has lots of fun designs and colors in this moccasin-style shoe. These water socks are made of polyester and spandex with a rubber sole. They are stretchy like socks with a smooth neck and the ability to wick moisture. Parents love that these shoes are easy to put on, stay on well, and are durable. 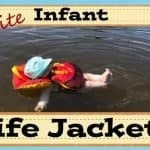 If you are headed to the beach or the pool, these are a great option for your toddler. These shoes come in 4 different sizes from 0-24 months. This fashionable shoe is a textile design with a rubber sole that includes drain holes for water. It has a thick arch for rough terrain and a smooth neck to avoid chafing. The design includes Relief Technology and keeps feet healthy by letting the muscles work, not dissimilar from being barefoot. It has the effect of acupressure for feet! It comes in 14 colors and designs and slips on with a solid strap too. 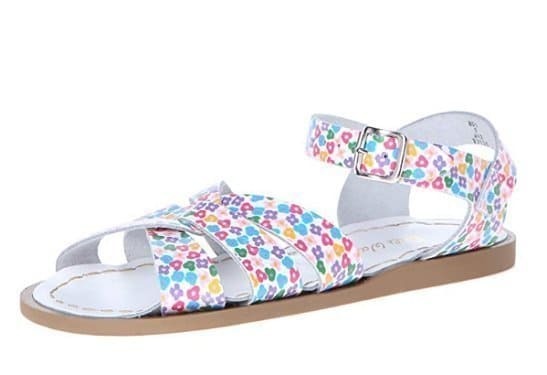 The Hydro Water Sandal is a strappy sneaker designed with a thick sole. It has decorative bungee lacing and comes in 10 colors with accent colors. It’s made of leather and textile with a rubber sole. It holds up for hiking with a wrap around toe guard and has an adjustable hook-and-loop closure. It is vented and includes a liner to avoid stickiness! 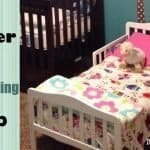 This a great hardy option for a kiddo who will be doing some walking and hiking! 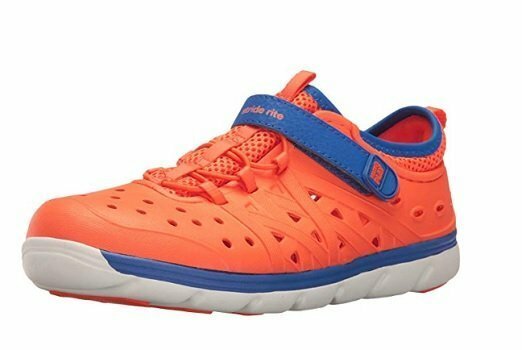 This is a basic, comfy mesh water shoe with bright colors! i safe products are made without ago-dyes and without formaldehyde. These shoes will go with other gear for sun and water by i play. The shoes are flexible with a pull loop on the back for taking them off and on. They protect kiddos feet and provide the traction they need. These shoes will dry quickly and can be hand washed. If you’re going for cute designs, this shoe is your jackpot! They have 31 adorable choices featuring all kinds of creatures and critters. This is an aqua sock, so they have a light sole with a natural, comfortable fit. The Adyorllya Water Shoes are made of quality flexible, durable material that’s comfortable, breathable, and fast-drying. They have a smooth neck and a pull tab at the back for taking them off. The designs are unisex, and it’s a perfect comfy shoe for almost any activity. This brand is great about refunds and replacements if you aren’t fully satisfied! This is The Original Sandal! They are the classic salt water sandal that started in 1944, when they were made from scraps from military boots during war-time shortages! The straps are 100% leather, and the sole is rubber with a half inch heel. They come in 17 colors, and the leather and rubber is perfectly versatile for some sun and salt water! 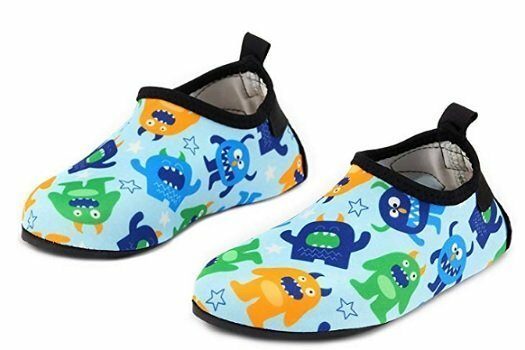 These high-quality water shoes are durable and comfortable for toddlers. Just a word of recommendation: before these sandals are worn for the first time, soak them in water. It will help prevent blisters. PLAE Mimo “Mighty Mariner” sneaker is a popular choice for toddlers. The shoe is lightweight EVA, and the sole is synthetic. This is a very carefully engineered water shoe, using anatomical science. It follows the contours of a foot to be healthy for a child’s growth. 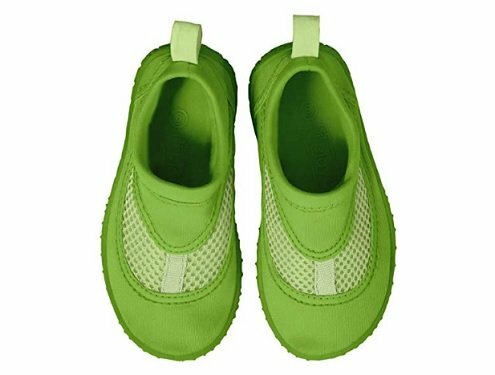 It has a secure, adjustable fit with a tongue and tabs to make it easy for shoes to come on and off. The sole is flexible for range of motion and protects from abrasion along with the toe guard. The heel avoids slips with a rubber, raised plug. It has an expanded tread pattern with raised lugs for extra slip grip. There are perforations a little higher on the shoe to avoid small rocks and debris getting under the foot. 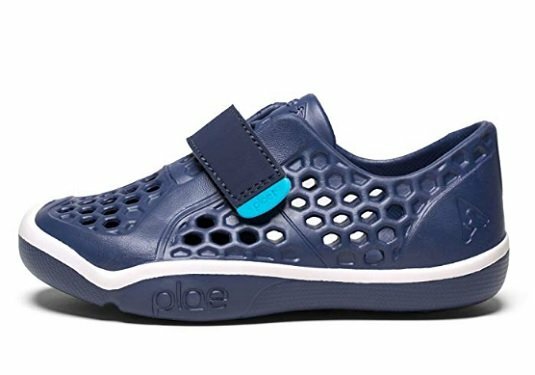 The PLAE Kids’ Mimo Sneaker comes in 8 colors. The quality of this shoe isn’t as good as others on this list. These shoes can cause blisters. As you can see, there is definitely something for everyone! There’s for sure a way to combine major cuteness with practicality and durability. And some pretty good deals too! The most important thing is your kids being able to play safely. 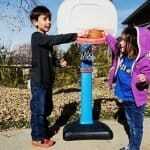 We most highly recommend the Native Unisex Kid’s Jefferson Slip-On Sneaker and the Stride Rite Made 2 Play Water Shoe.